Burns turned 34 on Thursday and came face-to-face with the Namibian at their pre-fight press conference in Glasgow. The Rickster welcomes the unbeaten Southpaw to the venue of his moment of history in May when he became Scotland’s first three-weight World champion with an eighth round stoppage win over Michele Di Rocco. Burns defended his crown for the first time with a dogged display against impressive mandatory challenger Kiryl Relikh in October. 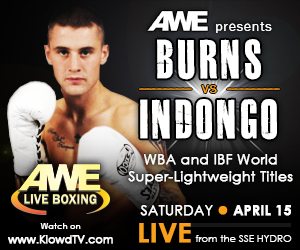 Indongo is the third man to test Burns in the Hydro cauldron, and Burns is in no mood to let slip another chance to create a piece of history as he aims to continue his remarkable career at the very top. “When I first started out you always think about winning belts and being in massive fights, but I never set myself any targets,” said Burns. “I just worked hard and when I got the chances, I took them and it paid off. I’ve had a few bad nights and it took me a while to move down to Essex and get used to training with Tony, but it’s clicked now. “I got the Di Rocco fight and I jumped at it. People noticed there that I still had something to give, I knew it was still there, but there were people that doubted that. “I don’t think about what I’ve done so far and I won’t until I hang them up. In my eyes, a fight is a fight. It’s always great to go into big fights like this one, but the pressure is big enough in World title fights that I keep stuff like legacies and so on away and just focus on what’s in front of me, that’s the way I’ve always been. “Don’t get me wrong, I’m happy with what I’ve achieved and people always say that I’m a three-weight World champion and only one of three ever in Britain, but I’ve not really thought about it and it’s not sunk in. “I just love fighting. People ask me all the time how long do I think I can keep going and my answer is always as long as I am not taking punishment, still want to do it and enjoy it, then I’ll keep going – and I think that there’s years left in me. Burns clash with Indongo is part of a huge night of action in Glasgow with two cracking British title fights leading the supporting cast as Scotty Cardle looks to land the Lightweight belt outright when he faces Robbie Barrett and Charlie Edwards and Iain Butcher clash for the vacant Super-Flyweight title.